Detroit’s Emergency Manager Kevyn Orr might declare the biggest municipal bankruptcy in the history of the United States later this year. One and a half years after a Michigan State University (MSU) report described a possible Chapter 9 Bankruptcy of the city of Detroit, this scenario is fast becoming reality. According to the Wall Street Journal, the emergency manager appointed by the state of Michigan is calling for a mid-June meeting with unions and creditors to hash out the framework of a debt restructuring, which includes Chapter 9. Chapter 9 is a bankruptcy procedure for distressed cities that allows the respective municipality to negotiate a payment plan with its creditors for all of its outstanding debt. Ordinary liquidations of assets comparable to normal bankruptcies cannot be undertaken by cities and municipalities. “There is no provision in the law for liquidation of the assets of the municipality and distribution of the proceeds to creditors. Such a liquidation or dissolution would undoubtedly violate the Tenth Amendment to the Constitution,” states an entry on the United States Courts website. There are four prerequisites that a municipality must meet in order to file for Chapter 9. It must have the approval of the respective state to file for Chapter 9 under the state law, must be bankrupt, must want to resolve its debts, and lastly, must have either the approval of its creditors or have negotiated with creditors in good faith. Detroit’s $16 billion debt load and its inability to deal with it lead to the city being taken over by the state of Michigan. The situation escalated to the extent that Michigan Gov. Rick Snyder took away control of the city’s finances in March and appointed Kevyn Orr, a bankruptcy lawyer, as an emergency manager. Orr was tasked to take over the duties of Detroit’s mayor and its city council on financial matters. After two months of scrutinizing Detroit’s books, a team of analysts reported to Gov. 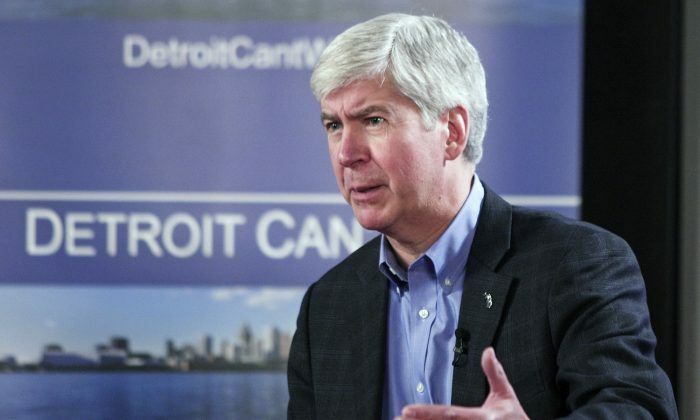 Snyder that the city was facing a financial emergency, according to the Huffington Post. Orr found a host of problems in a preliminary May analysis. The city is suffering from high unemployment, a declining population, loss of a large amount of state revenue, and shrinking revenues from decreases in income and property taxes. Expenses exceeded revenues by $100 million per year between 2008 and 2012, resulting in long-term debt of $462 million. Total obligations, including pension obligations, the city’s general fund, post-employment benefits, and retiree medical expenses now total more than $15.7 billion. Bit by bit, Standard & Poor’s, Fitch, and Moody’s lowered Detroit’s credit ratings, currently B/B by Standards & Poor’s, CCC/CC by Fitch and Caa1/Caa2 by Moody’s, resulting in higher borrowing costs. This has become a mute point, however, as the city has reached its legal debt limits and can no longer borrow in the market. If Detroit survives the coming debt restructuring intact, the state of Michigan will make sure that this does not happen again. Under an April 2012 agreement, a Financial Advisory Board was formed with the power to assess, oversee, and guide the city in all of its financial needs, especially the discharge of its debt. The agreement will stay in force for three years after Detroit has achieved a balanced budget and eliminated its deficit, or until it is granted a BBB rating by a rating agency.